On February 2, Les Amis des Musées visited the "Picasso.Mania" exhibition in Paris. Hereditary Grand Duchess Stéphanie, who is the patron of the art-loving organisation, accompanied the group for the visit to the Grand Palais. After viewing the exhibition with hundreds of paintings by Pablo Picasso, David Hockney, Jasper Johns, Roy Lichtenstein, Andy Warhol, Jean-Michel Basquiat and others, Luxembourg's ambassador in France, Paul Dühr, hosted the group for lunch. 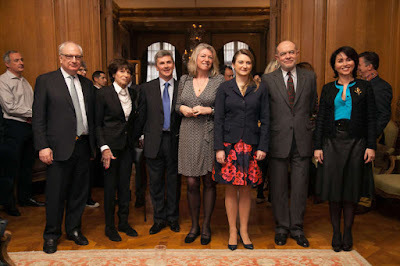 After luncheon, the group including Hereditary Grand Duchess Stéphanie also visited the exhibition "Lucien Clergue". More visuals at the cour, more information on the website of Luxembourg's ambassador in France.